It’s hard to throw a stone these days without hitting an indie Bowmore from the mid-late 1990s. It seems as though whisky geeks may finally be getting over the knee-jerk Bowmore bashing. Of all the outfits who’ve put out bottles of Bowmore, however, none presents values as extreme as those of Whiskybroker, from whence cometh this 14 yo. Whiskybroker is a concern run by Martin Armstrong, son of one of the owners of the Bladnoch distillery, Raymond Armstrong. What Armstrong fils’ source for casks is, I don’t know, but he seems to be able to consistently bring high-quality casks to market for highly affordable prices; prices so low in fact that they call into question the prices charged by other companies (not to mention the distillery bottlings). 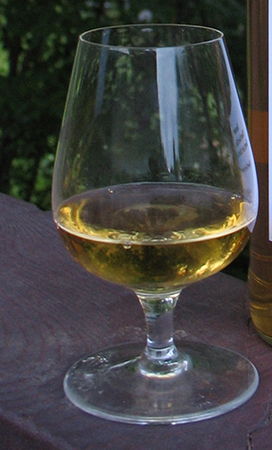 On the WhiskyWhiskyWhisky forum there was some controversy about this recently. David Stirk, the proprietor of Exclusive Malts, advanced the view that the Whiskybroker model is harmful for independents, as it runs the risk, he said, of offending the distilleries who are the source of the casks by undercutting their prices dramatically and by not creating distance between the indie brand and the official brand; and harmful for the industry as a whole as it may cut out distributors and retailers. These are interesting views, but, shortsightedly perhaps, I can’t help but think that getting good whisky for good prices can only be a good thing. 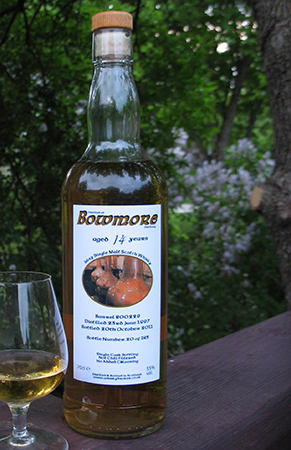 Especially when the whisky in question is a good Bowmore–as this Bowmore 14 hopefully is. Let’s dive in. Though the label does not specify, this is from a bourbon barrel (are there even such things as sherry barrels? I’ve seen bottles from sherry hoghsheads but not barrels). Nose: Creamy fruit (peaches, melon) and a lot of salt. Sweet smoke (is there such a thing?) which gets a little more expansive with time. There’s the trademark lavender now and also a minerally note that keeps it from being too cloying. With time the flowers and the fruit recede and the smoke comes to the front, more acidic and minerally/stony now. The flowers come back later but are framed now by dry smoke. A couple of drops of water brings out a berry sweetness–raspberry? cherry? A hint of citrus peel too. Palate: The first note is acidic smoke but it gives way immediately to a big bouquet of flowers (not that I usually eat flowers). Just a tiny bit soapy but nothing offensive. With time it gets quite salty. With water the salt takes a back seat to a sharp, minerally, slightly lemony smoke. Ah yes, a minute later, it’s certainly lemony now but some tropical fruit develops on the backend too. Finish: Longish. The floral notes at first but then mostly smoky and slightly peppery. Later it’s the salt that lingers. Water dials back the salt on the finish too and keeps the sharp smoke going. And it gets fruitier too. Comments: Neat, it’s solid but nothing more. But water really gives it some subtle development on the palate, pulling it up from the merely solid to the quite good category. Unless you’re a Bowmore completist there’s no reason to kill yourself looking for this (it’s long sold out). There’ll be another Bowmore 14 from a bourbon cask around in a day or two. Rating: 86 points (84 without water). This entry was posted in -Whisky by Rating, 85-89 points, Bowmore, Whisky by Bottler, Whiskybroker. Bookmark the permalink. I had some friends over last night to help me drink down some of the very large number of 6 oz “reference samples” i used to be in the habit of saving from my bottles until a few years ago. Of the four whiskies we drank last night this Bowmore was perhaps the group’s favourite. Sitting in the sample bottle for almost six years has done it a lot of good. That slight soapy note is completely gone and there’s a lot more fruit on the nose and especially the palate: lots of lime peel, melon, grapefruit; and it’s more minerally and peppery too now. If I were reviewing this sample I would be at 89-90 points.